How do you plan to celebrate ALL SAINTS DAY in this YEAR OF MERCY? How about showcasing saints performing the CORPORAL & SPIRITUAL WORKS OF MERCY? 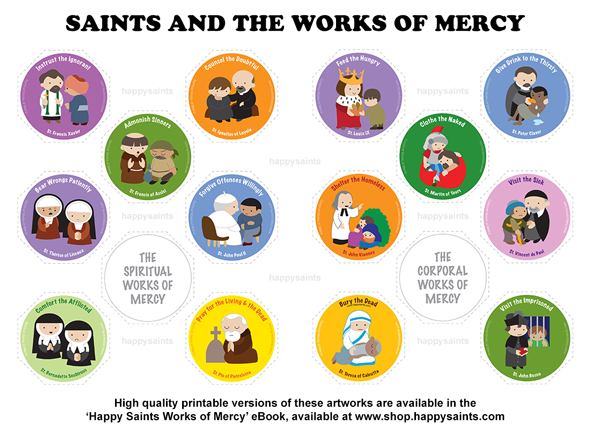 You can find all the resources in the ‘Happy Saints Works of Mercy’ eBook! It includes printable posters, cards, colouring pages and badges for all kinds of activities for the family or classroom! ‘Happy Saints Works of Mercy’ eBook now!